Elizabeth Black is an editor and writer with a long career in magazine publishing in Chicago and later in Washington D.C. She has also edited books for a number of publishers. 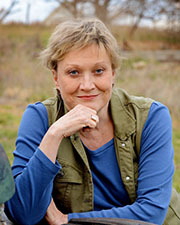 Her novel, Buffalo Spirits, based on her experiences growing up in western Kansas, won the Three Oaks Prize for fiction in 2003, and was a finalist in the William Faulkner Novel Competition in 2002. After moving to Lawrence in 2007, she worked as a Program Manager for the KU Osher Lifelong Learning Institute.